Company profile • CUP 2000 S.c.p.A. CUP 2000 designs, realizes and manages digital healthcare research activities and innovative solutions for the modernization of healthcare pathways, the improvement of the relationship between citizens and the Regional Health Service, and the rationalization of organizational processes within the social and health service of Emilia-Romagna. The company develops eServices for healthcare and welfare; above all, the Electronic Health Record (Fascicolo Sanitario Elettronico – FSE). Thanks to eHealth networks, the healthcare professionals, the healthcare system and the citizen share, every day, data and information in real time. CUP 2000 is a company limited by share, owned by the Emilia-Romagna Region, the regional Local Health Authorities, the Rizzoli Orthopaedic Institute and the Municipality of Ferrara. It is organized according to the in-house providing model. CUP 2000 is a Joint-stock Consortium Company, owned by the Emilia-Romagna Region, the regional Local Health Authorities, the Rizzoli Orthopaedic Institute and the Municipality of Ferrara. It is organized according to the in-house providing model. Numerous projects have been and are being realized. One of the main objectives is to bring citizens closer to online services: bookings, prescriptions, payments and delivery of health reports. Above all, the Electronic Health Record saw a pioneering role of Emilia-Romagna, which, to this day, together with Lombardy and Veneto, is a leader in the national experimentation on interoperability. CUP 2000 collaborates with the Regional Committee in defining the contents of the Emilia-Romagna Digital Agenda, and supports the system in accomplishing the objectives set by the “2014-2020 Strategy for digital growth” by the national Premiership. CUP 2000 is member of AsssinterItalia and Unindustria Bologna. The Company is certified in compliance to the standards ISO 9001:2015 and OHSAS 18001:2007. CUP 2000 was founded in September 1996, as a local Ltd. spin-off company for the management of the Joint Booking Center (Centro Unificato Prenotazioni – CUP) of the city of Bologna. In 2002, CUP 2000 became a joint stock company. It developed and gathered, over time, the patrimony of expertise of the first Metropolitan CUP ever realized in Italy, varying its activities through the conception of new products and the development of the necessary know-how for the realization of metropolitan CUPs in several territorial realities such as Genoa, Florence, Milan, Mantua, Naples. 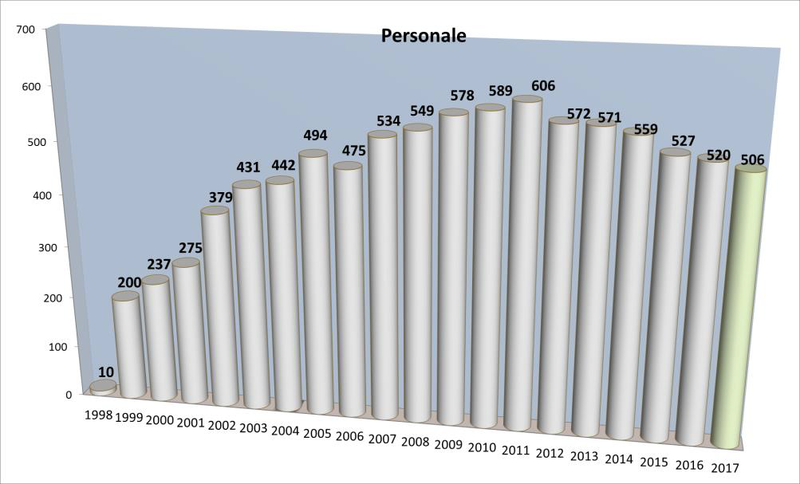 As the “Bersani Law” on regional companies came into force in 2006, CUP 2000 is now solely committed to the services provided to its shareholders. Since 1998 the company closes the books with positive results. After the first full year of operation as a Consortium Company, its 2017 turnover amounts to a production value equaling 30.727 million Euros, with a profit of 4.105 Euros. In 2017 the company employed 506 workers.